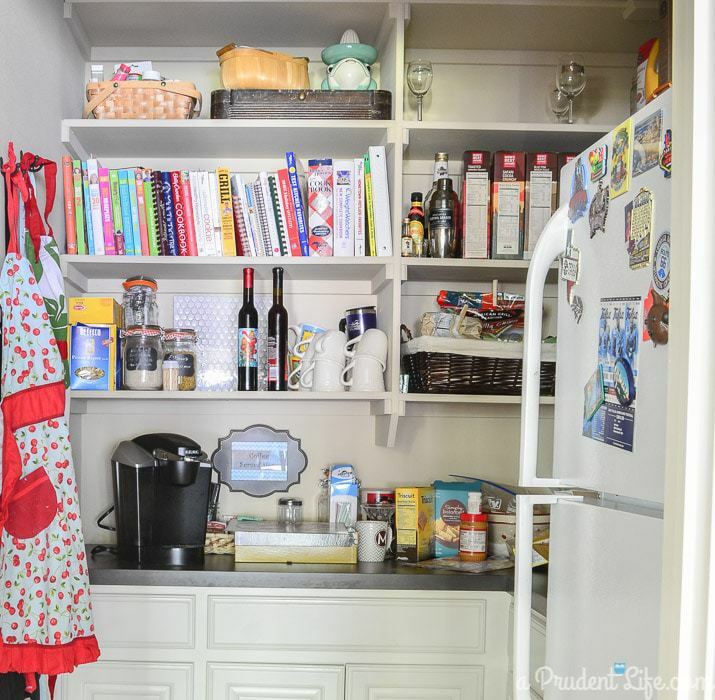 I personally love your “after” pantry; you’ve done a great job! Oh my gosh Emily-Grace! If we ever run into each other at Dollar Tree I’m going to claim you and your Kate Spade purse as a new best friend. Thank you so much for taking the time to write such an awesome comment. YOU seriously got ME and what I was going for in this room. Oh my gosh Kellie! It’s AWESOME that you are local and found me on Pinterest! It would seriously be an out of body experience you ran up to me at a TU game. I’ve never met one of my readers in real life, unless they knew me before the blog, or are a blogger themselves. Feel free to introduce yourself if you ever see me around! Popping over here from I(heart)organizing. 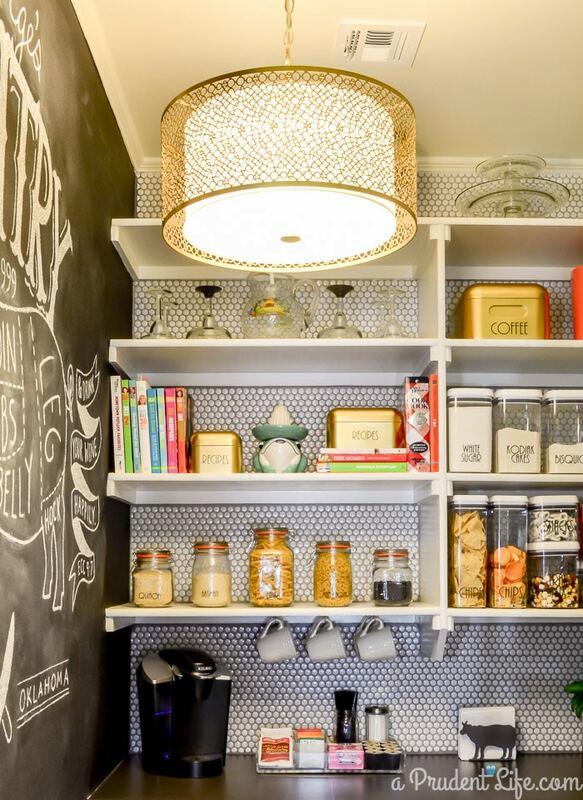 Now that you’ve had this pantry in place for awhile is there anything you’d change? I specifically am wondering about the can dispensers, do they work well? 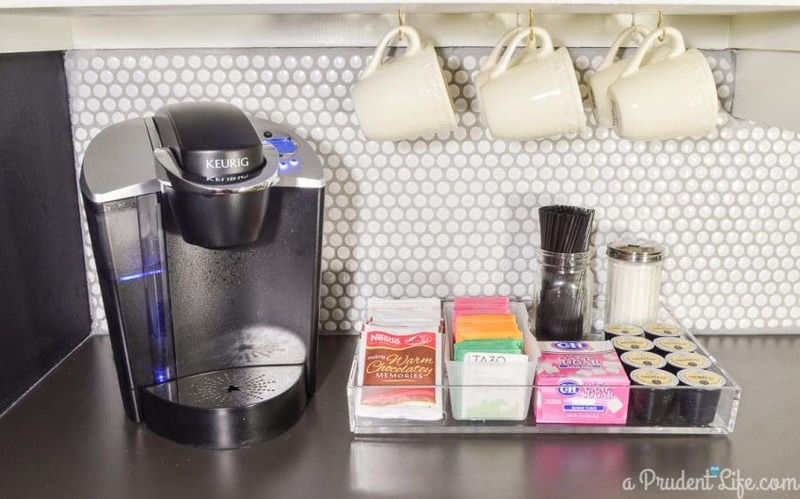 We move a lot (my hubby is in the Air Force) and I love to find organizational systems that can move with us! Hi Jen! Thanks for popping over! So far, I haven’t come up with anything to change. The can dispensers are perfect for us. The exact ones we bought from WalMart worried me at first because I thought they’d be too flimsy. I don’t notice that at all now, but you might consider ordering sturdier ones if you are moving a lot. I’ve also heard people who use more canned food than we do complain that they can fit more cans in the same space by stacking vs using the dispensers. 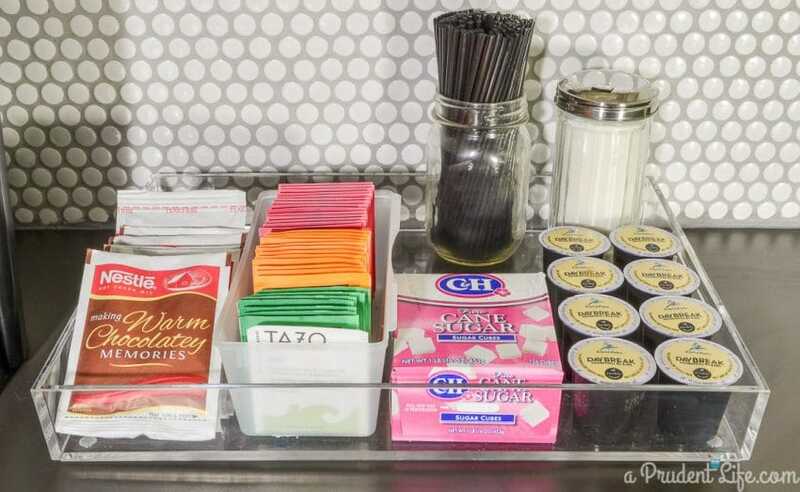 For us, that isn’t an issue because we still have open space in the dispensers. It is seriously amazing to need a can of Rotel and know exactly where is it going to be! No moving things around to find it AND the next can just rolls to the front without me having to rearrange things. Whew, sorry for the long winded response, but I DO love them! And thank YOU and your husband for your sacrifices. I totally cracked up at your “Kate Spade in the Dollar Tree” because that is ME, except it’s Goodwill or the $.99 Store! 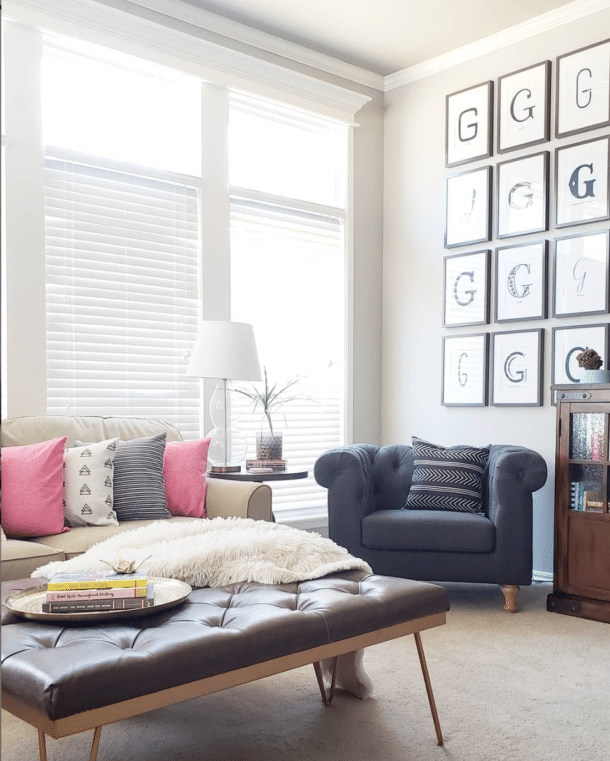 I came over from I Heart Organizing, and I love the makeover! It’s so nice when you find out that you aren’t alone in these odd contradictions. Thanks so much for stopping over – I hope you come back to visit again soon! 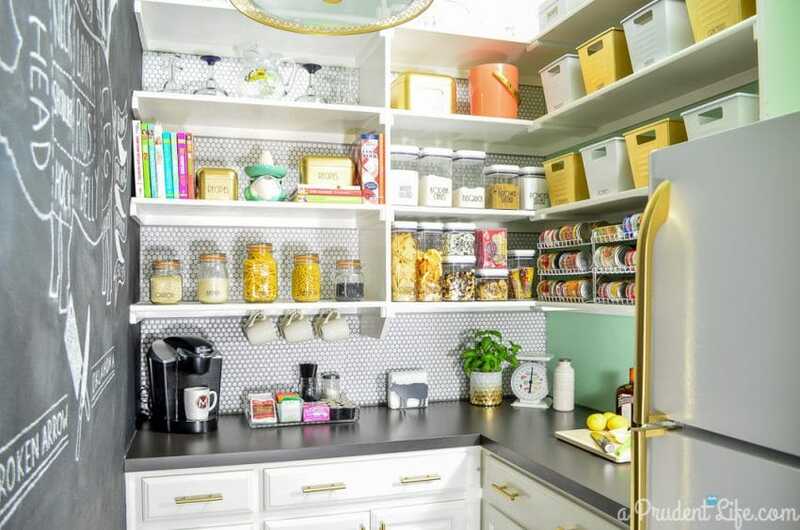 I love your pantry makeover! 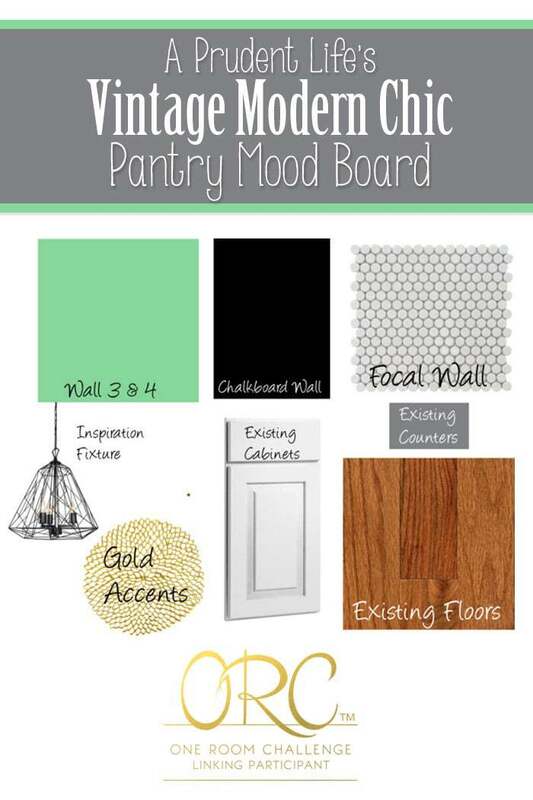 The tiles for the back splash wall were adorable and your use of gold and chalkboard were a perfect harmony. Great Job! Hello! Can you please send me the link to order the custom labels? i was wondering where you found all of your containers? it really is just a lovely space. Thanks Megan! 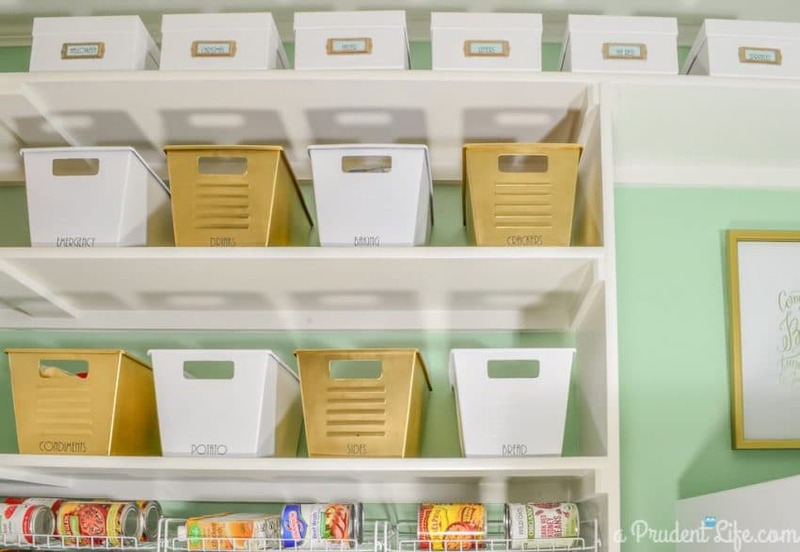 Toward the bottom of this follow-up post – http://www.polishedhabitat.com/2014/pantry-organization/ – there is a source list that breaks down where each of the organizing containers came from. Let me know if you have any other questions! Oh my gosh. Instant obsession. 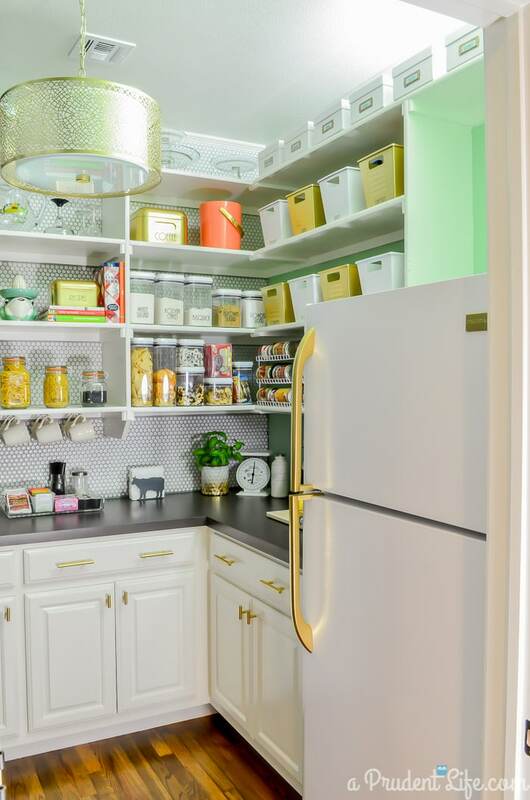 I am seriously in love with EVERY aspect of this pantry!! Those gold accents tho .. they steal my heart 🙂 Beyond fabulous job. 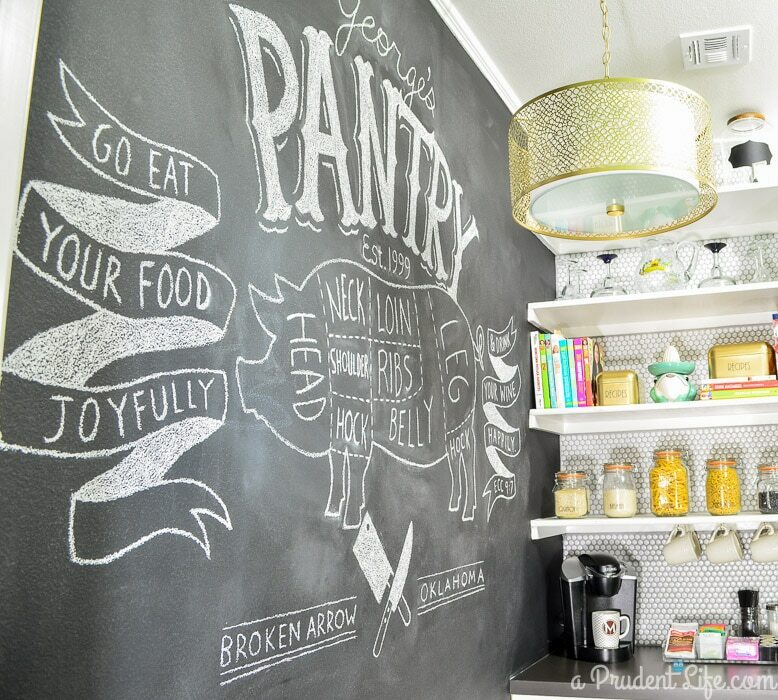 I absolutely love the entire pantry…I’m wondering if you have any information on the door! I’d love to have a door with the windows like that! Thanks! Hi Eileen – The door was provided by our builder, but I’ve seen similar ones at Lowe’s! 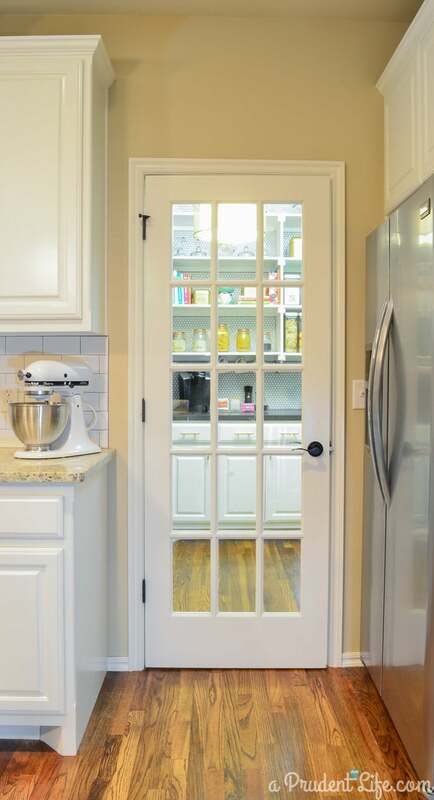 I am pretty sure it’s called a single french door. Thanks for reading! 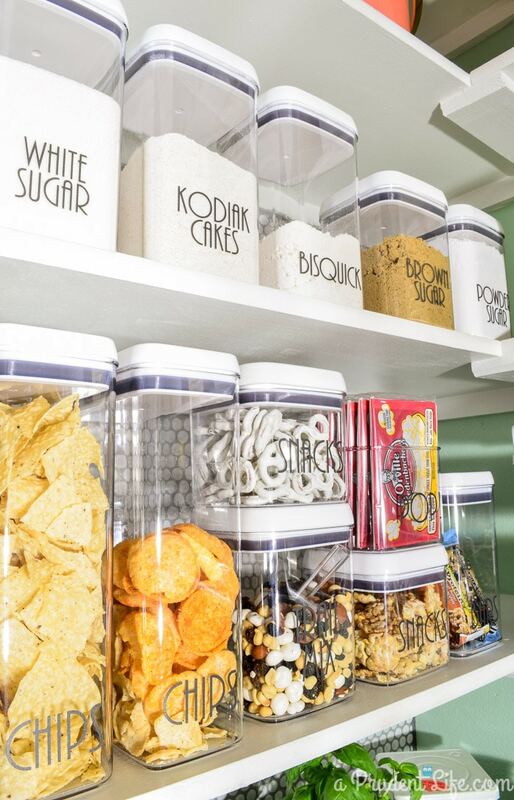 This may just be the coolest (can’t think of a better word) pantry I’ve ever seen. 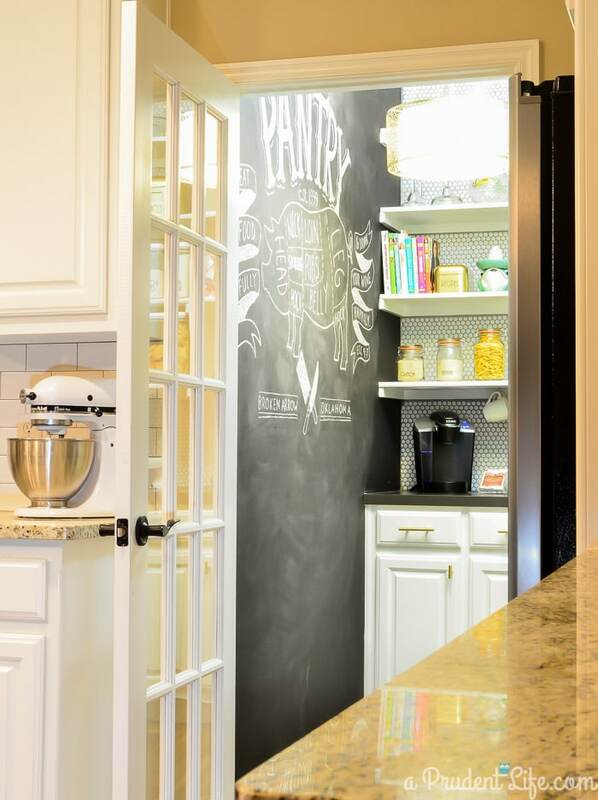 The organization is outstanding, and the chalkboard art?! Your husband has some serious talent. It’s all fantastic! Hi! I love the makeover. You did such a great job! I’m just curious as to how the spray painted hardware is holding up. I’m looking for hardware for our kitchen reno but there’s no way I’m paying $20+ for a drawer pull! They are holding up amazingly well – I have a six month follow up picture of them on this page about halfway down: http://www.polishedhabitat.com/2015/the-state-of-the-pantry-six-months-later/ I think I mention it in that post, but in case I didn’t, I don’t use them every single day, so even the six month update isn’t exactly the same as if they were in the kitchen. 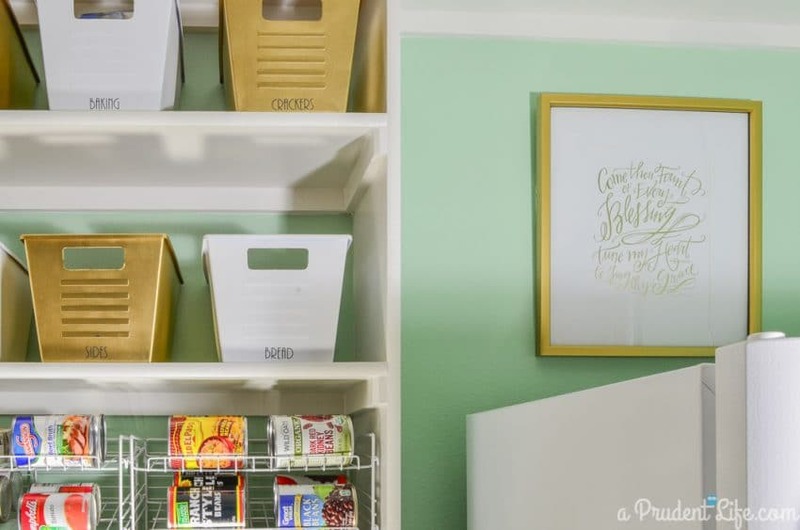 BUT, they are flawless enough in the pantry (now at 9 months out), that I wouldn’t hesitate to do that same pull/paint combo in our actual kitchen. I would guess that different pulls would take the paint a differently and if you had a super high gloss pull, it might be more problematic. A higher gloss paint might also have trouble sticking. Hope that helps! This is lovely! I was delighted with the backsplash tile you chose, and since green is my favorite color, every bit of the room that had green was perfect. Really nicely done. (My personal preference is silver over gold, but the gold really worked well in this space.) Really nice! Thanks so much Kathy! I’m glad you enjoyed the green accents. I usually fret over picking a color, but for that space I knew exactly what I wanted. You and your husband make an awesome team. 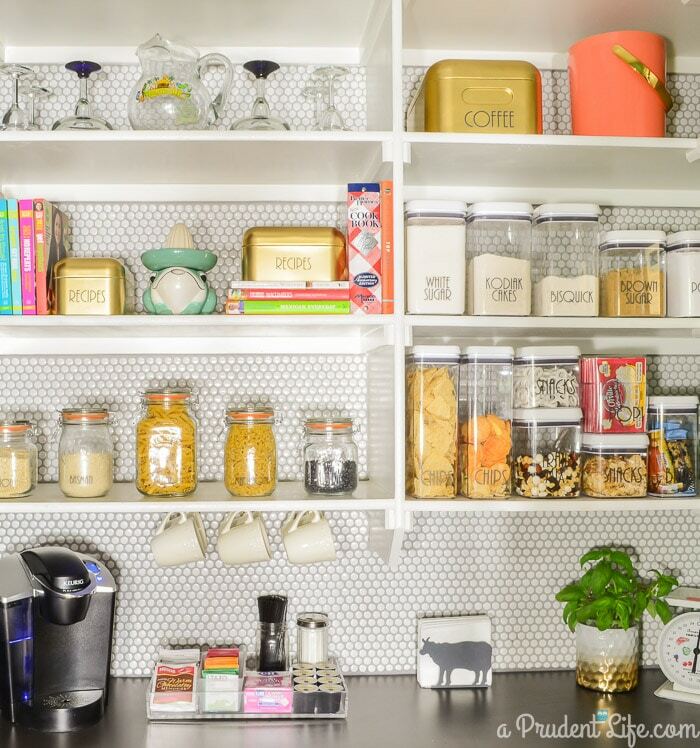 That is the most beautiful pantry I have ever seen. I love it. How did you paint the refrigerator door handle. I want to do that. Thank you so much Carolyn! It was really easy! The fridge handles unscrew so you can switch the door opening. I just took the handles off and spray painted them in the garage! For gold spray paint, I always use Rust-Oleum Metallic Bright Gold in either the 2x Coverage formula in the can that looks like this: (but it’s around $4 at Walmart) http://www.amazon.com/280724-American-Accents-Metallic-11-Ounce/dp/B00KZ6LW06/ref=sr_1_1?ie=UTF8&qid=1451573699&sr=8-1&keywords=rustoleum+2x+gold or if you can’t find that, the Rust-Oleum Bright Coat line (http://www.amazon.com/Rust-Oleum-7710830-Bright-Metallic-11-Ounce/dp/B000Z8FGE2/ref=sr_1_2?ie=UTF8&qid=1451573782&sr=8-2&keywords=rustoleum+gold). WalMart & Home Depot almost always have one or the other of them. I recommend them over the fancier Universal formula for the gold color. Thanks Linda, they are BHG branded Flip-Tite containers from Walmart. Just wondering how ge cabinet hardware is holding up since yoy didnt prime them first? 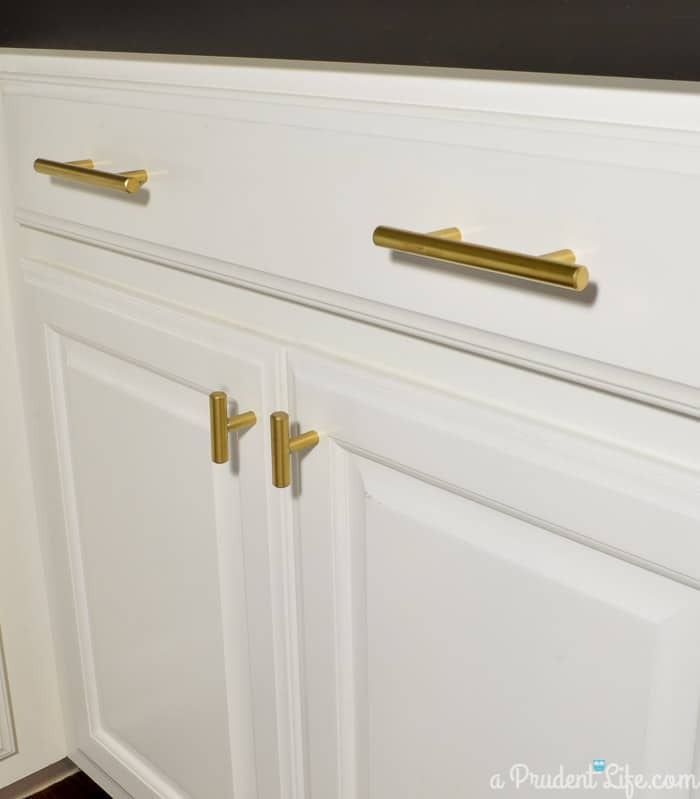 Beautiful transformation but I gasped when I saw you spray those handles with gold (non priming) paint, because I did the same thibg in my bathroom and the paint scraped off after a few months and lots of handling. I’m so sorry I didn’t see your question before Heather. The handles in the pantry have been painted about 18 months now with no signs of chipping. 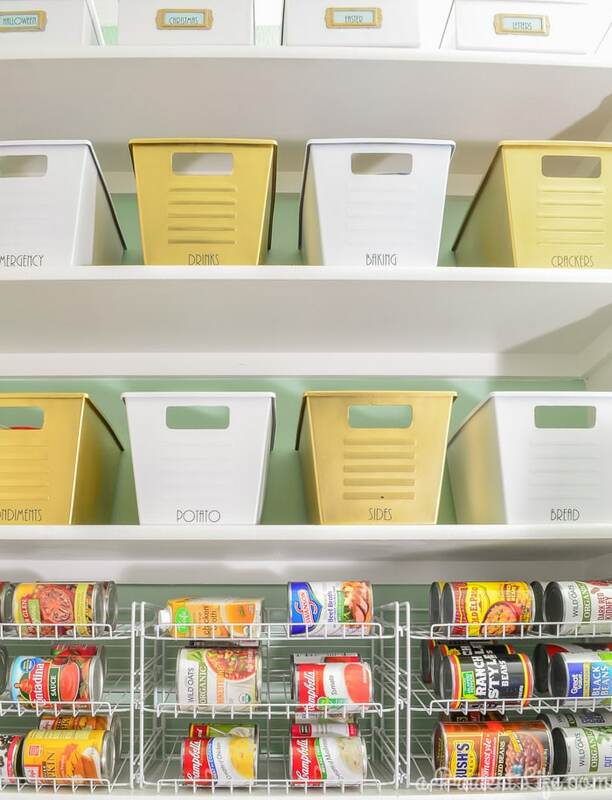 We ended up doing the same thing for the pulls in our master closet 6 months ago, and they are holding up to daily use so far as well! The handles we use are a satin finish, so maybe if yours were glossier to start it couldn’t adhere as well? 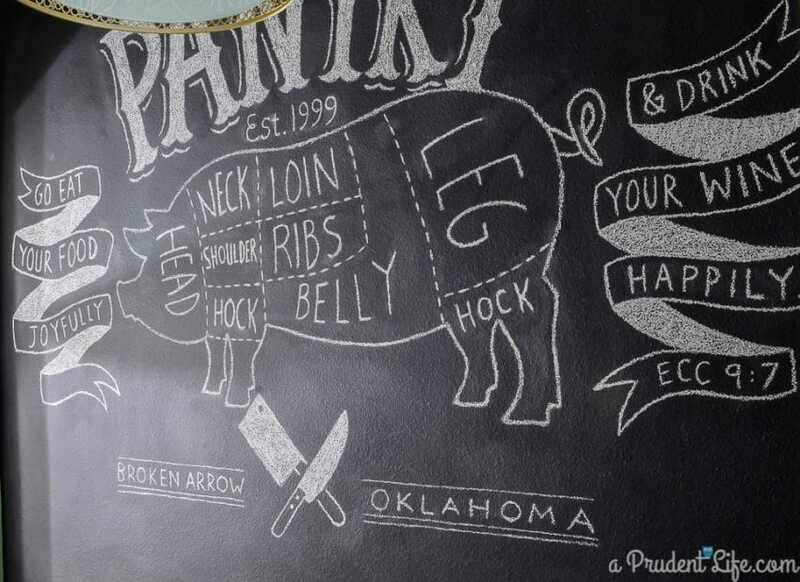 Oh my goodness – your pantry pig is amazing! 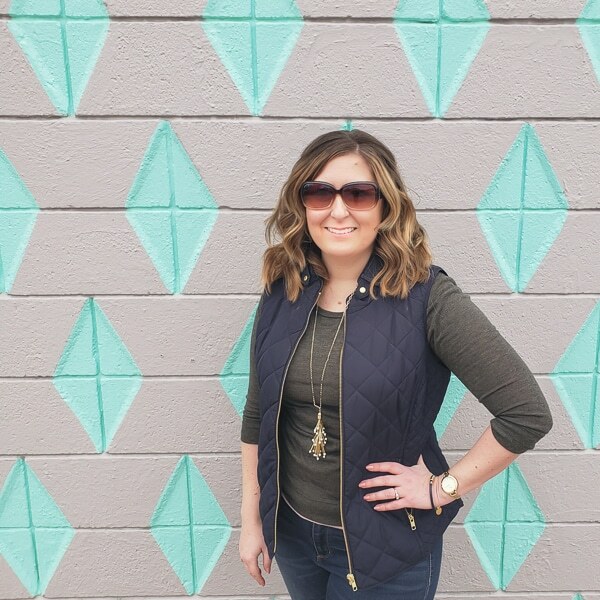 I can’t believe that was your husband’s first time creating chalk art – he has some serious skill! 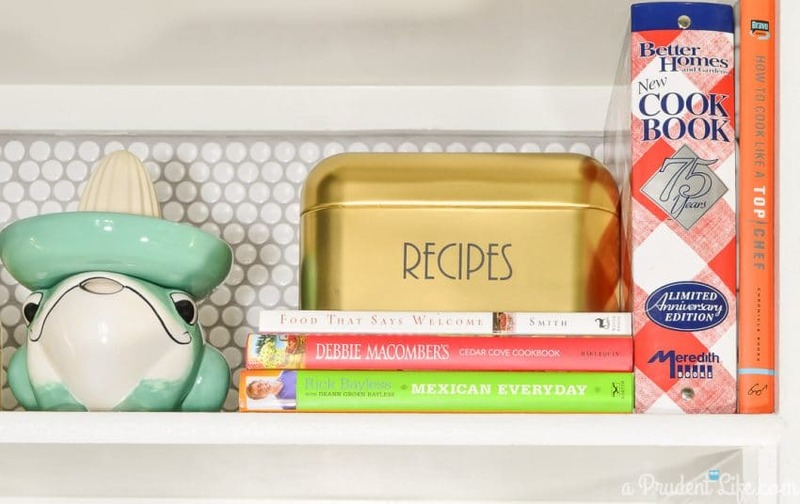 Also – I have the same Lowe’s pendant in my office, but I left it silver 🙂 It looks awesome in your gorgeous pantry!